What are they doing out there? Are they standing on the water?? Is it a sport? Is it magic? Is it good exercise? Is it surfing? How do I do it? How—you ask—can I be that cool? If you’re new to the world of stand up paddle boarding, these are surely the exact questions you’ve been asking — or too embarrassed to ask. But you can relax — this here is a thorough guide on everything you need to know as a stand up paddling (SUP) newbie. Pore over this divine text and you’ll come out with all the knowledge you need in order to talk like a seasoned paddler, and to make sure you choose the right board and know how to get started riding it safely. At Globo Surf, we strive to be the best, most reliable buying-guide for stand up paddle boards. We provide reviews on a number of our favorite boards on the market, and breakdowns to help you figure out which type of board is right for your budget and your needs. If you’re planning to buy in-store, we encourage you to read through our guides first to make sure you’re an informed shopper. If you’re going to buy online (and if you found our write-ups helpful), consider doing us a favor — use our Amazon links to earn us a small referral commission and help us keep running the site! It’s a great, safe workout. First of all, like many water sports, stand up paddling is a low-impact activity. That means it’s easy on the joints and ligaments. 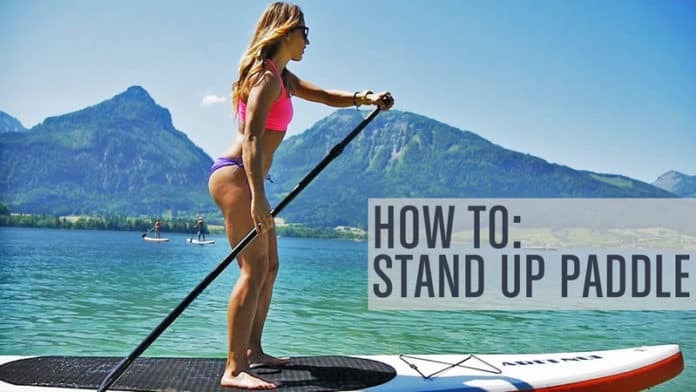 As long as you’re using proper form (see below under “How to Do It”), stand up paddling is a great way to get a workout without putting excessive wear on your muscles and joints. Though you might expect to primarily work your arms and shoulders, stand up paddling actually brings your whole body into play. Your legs and core constantly do subtle work to keep you stable, while rotation from your core helps to push the paddle through the water. It’s a full-body workout that feels natural and smooth, so that you hardly feel like you’re working out at all. Also, stand up paddling is great for your cardio health. Since it’s not a heavy-duty strength activity, it’s easy to ride around for a long time and gradually build up a good cardio workout. For that reason, stand up paddling is considered a very good cross-training activity. It’s a fun group activity. Getting out on a stand up paddle board gives you maximum freedom on the water. You’re not confined to the seat of a kayak or canoe, or isolated in your own boat, or, god forbid, stuck squirming down there in the actual water itself with those poor defenseless swimmers. Once you start paddling you’ll see how this sport is naturally conducive to gathering and hanging out with others on the water. You can race and make up games, you can explore the shorelines together, or you can simply bob around and enjoy the serene scene with a friend. It’s a beautiful way to enjoy nature. Again, there’s something truly unique about being able to comfortably stand and balance on the water. Part of why so many people are drawn to this sport is because it just feels great to effortlessly glide across the water. You get a beautiful all-around view of the lake or ocean, from your own private vessel. And as long as you get a versatile board (see below for info on “Choosing a Board”), you can adventure out in all sorts of conditions — lakes, rivers, oceans. The first time you try stand up paddling, it’s best to go out on flat water, like a lake or a calm river. You may also want to start out kneeling, rather than standing. Wade into shallow water with your board, then place your paddle flat across the board. Hold the rails (the sides) of the board with your hands, and climb onto the board. Mount yourself on the board in kneeling position, a little behind the center of the board. Adjust your position until you feel comfortably balanced, making sure that the nose and tail both stay above the water. Once you’ve established a comfortable kneeling balance, it’s time to stand! With your hands still on the rails, raise yourself to a standing position one foot at a time, and pick up the paddle with you as you get up. Face forward (unlike surfing, where you face sideways). Set up your feet about as wide as your hips, and make sure they’re both the same distance from the center of the board. Do not spread your feet all the way onto the rails. Make sure your toes are pointing forward; give your knees a slight, comfortable bend; and keep your back straight — always maintain good posture (in all aspects of life, please)! If you’re staring at your feet, don’t! Gaze ahead at the horizon and trust your hips and core to keep you balanced. If all this sounds complicated, don’t worry. Most stand up paddle boards are very easy to balance on, and setting up a good stance comes pretty naturally. Also, once you start moving, it becomes easier to balance — just like with riding a bike. Yessss, here we go. Now it is finally time to start moving. Paddling works the same way on both sides (duh), so we’ll just explain one, then you can figure out the other. To paddle on the right side, your left hand should be at the top of the paddle, and your right hand around the middle of the paddle shaft. Adjust as necessary to find the position that’s comfortable for you. If your paddle has an elbow (an angle) the elbow should be facing away from you. Now, to paddle most effectively, you should make a point of twisting with your whole torso, rather than excessively using your arms. You get more power this way, and avoid over-working and injuring your arms. So keep your arms relatively straight and use your whole upper body to twist. Use your left (top) hand to push down on the paddle grip, so the paddle goes into the water as you twist your torso. Pull the paddle back out of the water when it’s near your ankle. Start out with small strokes. It takes surprisingly little to get moving. To keep the board going straight, you can do about 4 or 5 strokes before switching to the other side. Got it? Now simply flip the paddle around and do the same on the left side. You’re very smart — we’re sure you can do it. But of course, you can’t keep going straight forever. That wouldn’t be any fun, and anyway you’d probably run into someone eventually. So, it’s time to learn to turn. The simplest way to turn is to just keep paddling on one side — this is called “sidestroke”. If you keep paddling on the right, you will gradually drift to the left, and vice versa. For a sharper turn, paddle backwards — the “backpaddle”. If you paddle backwards on the right side, you will turn right. And vice versa! Your final option is the “sweep stroke”. This is like a regular stroke, front to back, but just longer. Place your paddle up near the nose of the board and sweep it all the way around in an arc toward the tail of the board. This will give you a somewhat sharper turn, but without slowing you down like the backpaddle maneuver. It can also help to step backward slightly on your board or look over your shoulder in the direction you are turning. This pushes the balance a bit and speeds up your turn. Again, a good paddle board is quite easy to balance on, so you really shouldn’t have too much trouble getting up and getting going. However, it is very possible that you’ll fall from time to time, especially when you’re starting out. Don’t worry! You’re on the water. Just make sure to take advantage of that fact— when you feel yourself going down, try to fall on the water instead of the board. This will lessen the likelihood of injury. As you get your wits back together in the chilly water, wade over to your board first, then paddle yourself over to get the paddle. There you go. We told you it would all be okay! Okay, sounds like a lot of fun. But before you can stand up and balance and paddle and fall off (gracefully) and all that, you need to get the right board, right? 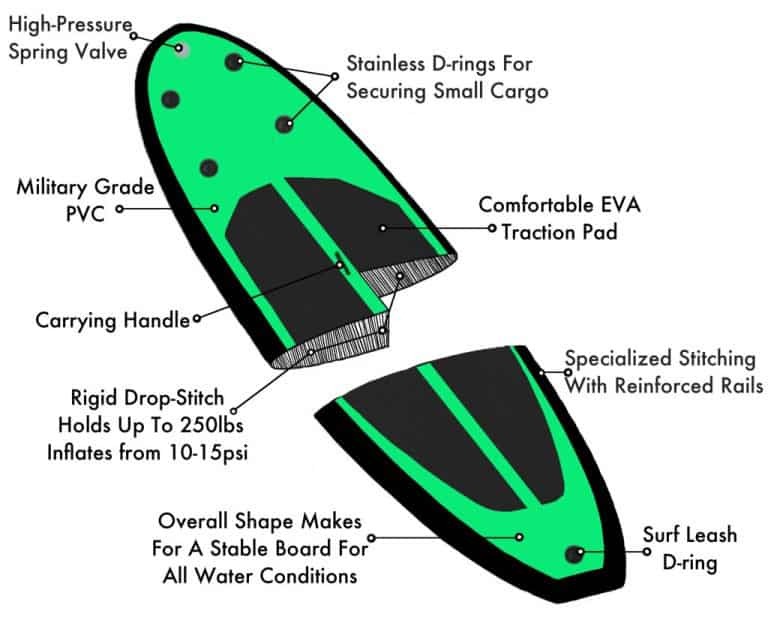 Planing Hull — A planing hull is the best all-around shape for a variety of paddle boarders, especially beginners. This nose type is flat and wide, so it is well-balanced on the water and can handle small waves. This will serve you well in a variety of water conditions. Displacement Hull — This type of hull has a pointed nose, helping it to swiftly cut through the water, more like a canoe or a kayak. Boards with displacement hulls are often longer and narrower than other stand up paddle boards. Thus, they are faster, but can be somewhat more difficult to balance — better for more experienced, competitive riders. Short boards — under 9’: Shorter boards will be slower in the water, but easier to maneuver, making them fit for surfing. Medium boards — 9’ to 12’: This range covers the appropriate board lengths for the majority of riders. Beginning paddlers should most likely look for a board in this length range. Long boards — 12’ to 14’: Longer boards will have more momentum, but they’ll also be harder to turn. They often will be shaped with a displacement hull. This style of board is called a racing or “touring” board, and it’s ideal for more advanced riders prioritizing speed. The width of your board determines its stability. A wider board will be a more stable board. However, the narrower a board is, the faster it will be. Wide boards — 31” or more: A wide board is especially easy to balance. Boards 31” wide or more are ideal for most beginner stand up paddlers. Narrow boards — 30” or less: Narrower boards will move faster through the water, but they’ll be a bit more difficult to balance, and thus less ideal for beginners. Perhaps the first thing to consider, when buying a stand up paddle board, is whether you want an inflatable or a solid board. If you want a solid board, do you want a traditional solid board or a soft top? Inflatables are increasingly popular, as they are highly durable and compete very well with traditional boards in rideability. Many inflatables are nearly indistinguishable from hard boards once inflated. Rest assured, these are nothing like the inflatable pool toys you’re used to! Inflatables are easy to store and take about 5-10 minutes to inflate with a hand pump, or less if you get an automatic pump (these usually plug into your car). However, if you have the storage space in your home, and don’t mind transporting your board, a traditional solid board can be a better choice. This helps you avoid the minor hassle of inflating and deflating each time. Additionally, soft top boards are a bit safer in case you fall on the board. EPS foam: EPS foam is the “traditional” style of stand up paddle board, and it is the most common. This construction is usually a foam core wrapped with fiberglass and epoxy. Hollow core: Hollow core boards often look similar to EPS foam boards on the outside, but the hollow core keeps them a bit lighter, making them faster (but potentially less stable). Polyurethane foam: Polyurethane foam is a more affordable material than EPS, but it is heavier. Inflatables: Inflatables are usually made of PVC or another durable plastic material. They can often be even more durable than traditional boards, due to their plastic construction, which won’t get dinged and scratched. The downside, once again, is that you will have to pump up your board each time you use it. Even an affordable stand up paddle board is not the cheapest investment — but fortunately, it doesn’t take much more gear to get going and get out on the water. Many boards (especially those for beginners) come packaged with a standard set of basic gear so that you have everything you need to get started. This is especially important if you’re getting an inflatable board. When checking out board packages, look for ones that include the board, a paddle, a pump (if it’s an inflatable), and a carrying bag, or at least a carrying strap (for rolling up inflatables). — The board: this is the main event and your most important decision. As detailed above, the board you choose should be based on your skill level and your style of riding. For beginning riders, our guide to the Top Stand Up Paddle Boards is a great starting point to find a high quality and affordable board. — Paddle: Paddles for stand up paddling differ from other paddles in that they have an “elbow” (an angle). Your paddle should be about 6”-8” taller than your height. — Leash: Most boards don’t come with a leash, but it’s a good idea to buy one, especially if you’re a beginner. A leash will ensure that your board doesn’t glide away if you fall off. There are different leashes depending on where you’re riding — flatwater, surf, or rivers — so make sure you get the right one. — Flotation Device: We recommend always wearing a life vest — in some places this is legally required. Find out before you go paddling. — Sun protection and clothing: Always use sunscreen and consider wearing sunglasses. In cold weather or cold water, you may want to wear a wetsuit or a dry suit. Normally, however, shorts and a t-shirt, or a bathing suit, will be fine. — Traction Pads: Nicer boards (especially inflatables) will usually include a traction pad mounted on the deck. If not, we recommend buying one. Installing is simply a matter of pasting the pad on the deck. If you don’t want a traction pad, you can also use surf wax. 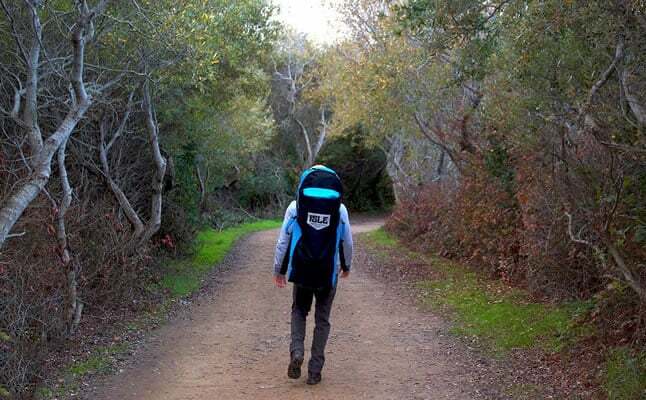 — Board Bags: A bag is not essential, but is worth considering for the sake of transport and protection. 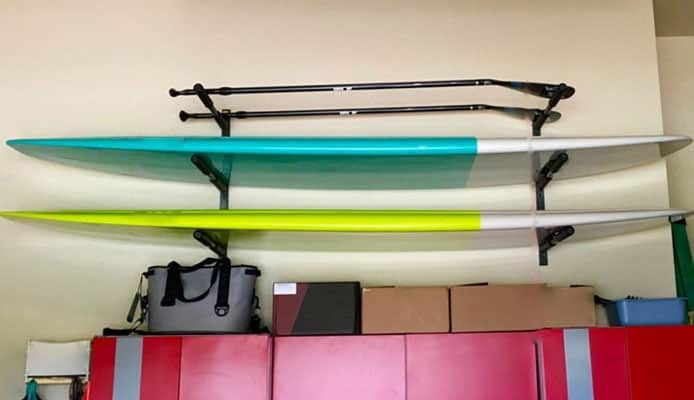 — Automatic Pump: If you’re getting an inflatable stand up paddle board, an automatic pump can save you from the sometimes-strenuous work of hand-pumping your iSUP. Have you tried paddleboarding yet? Let us know how your experience was and how much you enjoyed it. We love hearing from you in the comment section below. 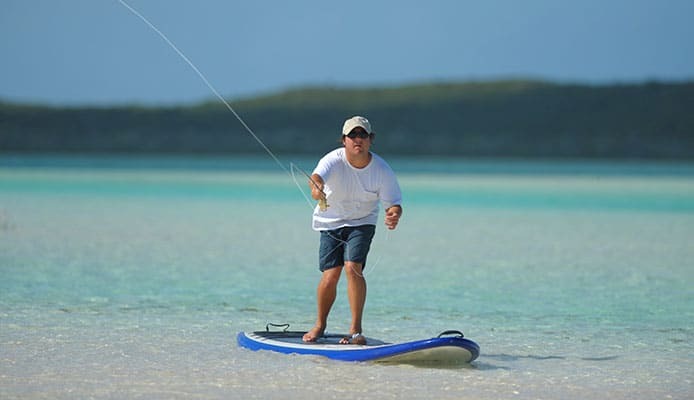 Paddle Board Fishing vs. Kayak Fishing: Which Is Better?